Rome is full of so many ‘must-see’ sights it’s easy to become overwhelmed. For those people planning to spend an extended time in the Eternal City or on repeat visits here are 12 hidden treasures in Rome which will take you beyond the normal tourist spots. There are many more than 12 but this is a good starting point. Jewish Quarter – Jewish Ghetto. One of the most vibrant and beautiful neighbourhoods. As well as great food and great shopping the area resonates with its history Jewish history in Rome dates back to the 2nd century BCE. Visit the Great Synagogue of Rome and the Jewish Museum with its collection of artifacts, documents and photography spanning over 20 centuries of continuous habitation in this quarter. You’ll also find the Teatro Marcello, resembling a mini Colosseum and the Portico di Ottavia, one of the four gateways to the Jewish Ghetto. Testaccio This working class neighbourhood may not be the most picturesque but for ‘foodies’ it boasts an abundance of great food, history and character. The market is a food-lovers destination and a great place to shop and eat. Rome’s old slaughterhouse is home to a branch of Rome’s Contemporary Art Museum (MACRO) and Monte Testaccio, a large, man-made mountain dominating the neighbourhood was created from the shards of an estimated 53 million terracotta pots. Testaccio market is just down the road from our next recommendation so you can do both in one morning. Protestant Cemetery The resting place of poets Keats an Shelley or as its officially known, the non Catholic Cemetery for foreigners described as ‘one of the finest places in the world to be buried’. A charming and contemplative spot, far removed from the noise and chaos of central Rome. Located next to the Pyramid of Caius Cestius and accessible by Pyramid Metro Station. Villa Doria Pamphili A 17th century villa in the largest landscaped public park in Rome. The Borghese Gardens teems with people most of the year now so these gardens offer a perfect alternative when you just need some time out or a great spot for a picnic. Appia Antica Feel like a bike ride (or you can walk it) this is the perfect spot. 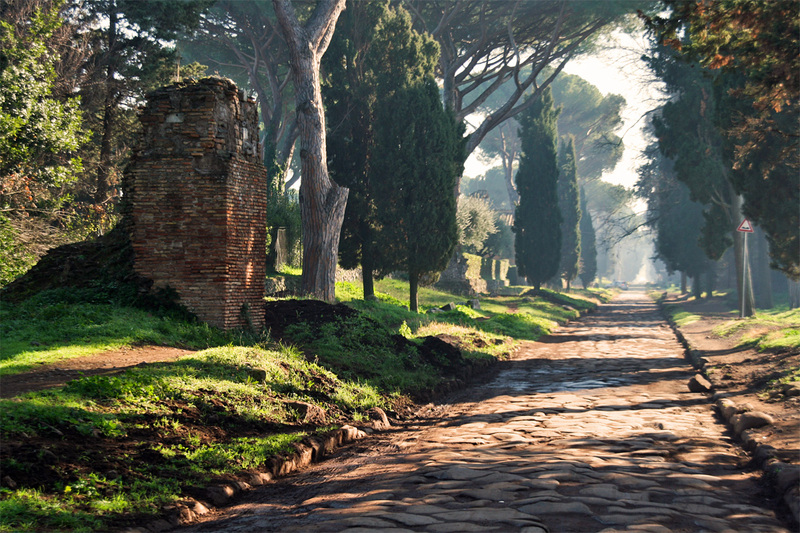 Construction of the Appian Way commenced in 312 BC and it has a long and sometimes dark history. Spartacus and 6,000 of his rebel slaves were massacred here. As you follow the route you’ll pass numerous medieval towers and fortifications as well as renaissance and baroque churches and important Christian catacombs. Borromini’s Perspective Surely one of Rome’s most unique hidden gems and perhaps the strangest. Located in the Palazzo Spada, Borromini created his masterpiece of forced perspective optical illusion in the arcaded courtyard. San Luigi dei Francesi Near the Piazza Navona, the Church of Saint Louis of the French contains what is considered Caravaggio’s most powerful work, ‘The Calling of Saint Matthew’ plus two more of his works. Whilst other Caravaggio works can be seen in Villa Borghese this is one not to miss. Ostia Antica On the banks of the Tiber, this ghost harbour city of ancient Rome is easily accessible from central Rome. It’s been described as the most ‘underappreciated site in all of Italy’. Stroll the main street keeping your eye out for mosaics and frescoes. The Theatre built in the 1st century AD could seat 2,700 people and you’ll discover the Capitolum, an important temple as well as the well-preserved baths complex. 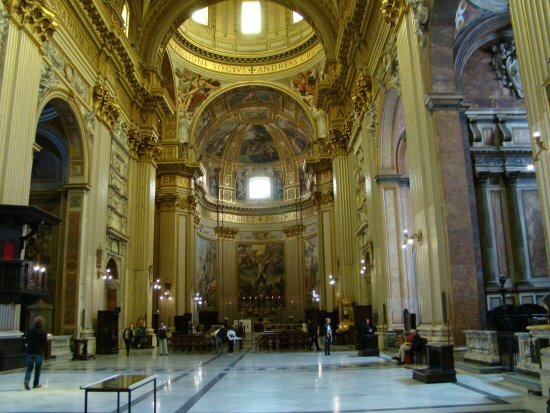 Basilica di Sant’Andrea della Valle Perfect for opera lovers as this historic baroque church was where Puccini set the opening act of his opera, Tosca. With its great white marble hall glittering with god and awash with bold paintings it makes for the most ‘theatrical’ of churches. The tombs of Pius II (the first great European humanist – 15C) and Pius III are located in this church. Gelato – Almost everywhere and totally irresistible. Click the link for a list of the 10 best places to buy gelato in Rome.